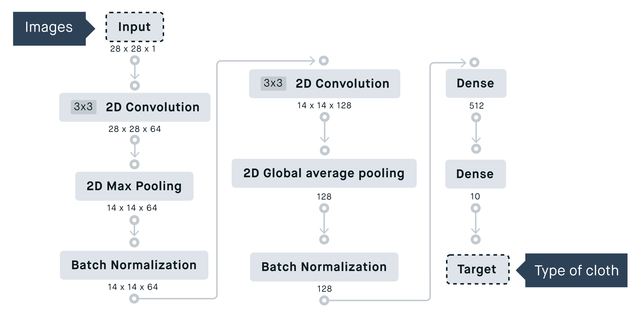 This tutorial will show you how to build an image classifier, taking you through creating the typical building blocks of a convolution neural network for a 28 x 28 pixels imageset with 10 classes. Taking the input dataset, establishing the convolution layer, pooling/downsampling, flatten and classifying. Deep learning image classification has many applications in the retail industry and will drive much of this predicted value, for example, reducing errors in supply chain management (accurate inventory/catalog management by automatically identifying items from photo) or as a component in visual search from user-generated content (a customer uses a photo taken on their mobile device to locate or search for similar items in a shopping catalog). Image classification in deep learning is often implemented using a technique called a convolutional neural network (CNN). In this tutorial, we will be building a CNN that will be trained on thousands of images of fashion items (e.g., clothing, accessories, shoes) that will create a model that can be used to predict for a given image what type of fashion item it is. Although the CNN-model, in this case, will identify fashion items, it can be trained on any class you require. For example, in healthcare, this technique could take a brain scan as input and predict if it contains a tumor or it could be used to classify a personal photo library, much as Apple or Google do with their photo applications. You will use the Fashion MNIST dataset which is an image classification dataset that consists of small, 28 x 28 pixels, images of clothing or accessories such as shirts, bags, shoes, and other fashion items. Each image is annotated with a label indicating the correct garment. The images come from Zalando and consist of a training set of 60,000 examples and a test set of 10,000 examples. For example, if the number of test samples is 1000 and the model classifies 952 of those correctly, then the model's accuracy is 95.2%. We’ll set our goal to 0.9, i.e., correct prediction 9 out of 10 times. We can note that the “world record” is 0.967. 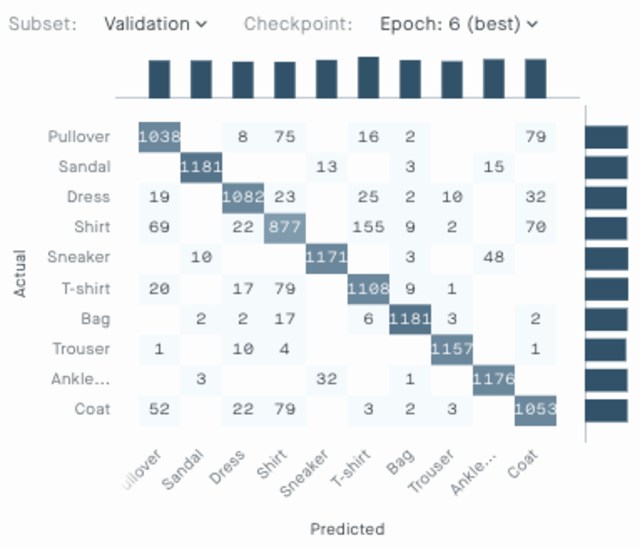 For more benchmark, check Zalando’s collected benchmark classifiers here: Fashion MNIST benchmark. First, create a project and name it, so you know what kind of project it is. Naming is important. A project combines all of the steps in solving a problem, from pre-processing of datasets to model building, evaluation and deployment. Click on the Import files tab. Copy and paste the link below and click Import. The zip includes the whole Fashion MNIST dataset. When done click Next, name the dataset FashionMNIST and click Done. As you can see in the Inspector on the right, the dataset is by default split into two subsets: 80% for training and 20% for validation. That means we'll use 80% of the set to train our model and the remaining as 'not seen before' examples to see how well the training is progressing. The percentage of correctly guessed labels on the validation set will produce the accuracy number we're after. Use the default subsets for this tutorial. You’ve now created a dataset ready to be used in the platform. Click Save version. Saving this version will lock and version it and allow you to build a model with it. Navigate to the Modeling view. The result from this experiment is a trained AI model that can be evaluated and deployed. Click New experiment. Name the experiment and click Create. In the Inspector, click on the Settings tab and make sure that the dataset you just created is selected in the Dataset wrapper field found in the Dataset settings section. In the Inspector, click on the Blocks tab. Click on Snippets to expand the section and click on CNN. This will add a complete convolutional neural network (CNN) to the experiment. A CNN is often used when you want to solve an image classification problem. This network is looking for low-level features such as edges and curves and then building up to more abstract concepts through a series of convolutional layers. Concatenate. This block concatenates a list of inputs. Dense. This is a densely connected neural network layer. After this step, the Information-center-popup dialogue should have appeared showing you what needs to be adjusted before you can run the model. Let's do just that. Select the Input block in the Modeling canvas. In the Inspector set the Feature to image. Next, select the Target block and set the Feature to category. Keep the default value for Loss, Categorical crossentropy. This loss function computes a score that the model uses to decide which garment it is depicted in the image. If there were only 2 classes in our data (t-shirts and shoes), you could choose binary crossentropy. We have 10 classes, thus categorical crossentropy. Select the last Dense block in the model. This is a densely connected neural network layer. Keep the default value for Nodes, 10. This is the number of labels. Keep the default value for ​Activation,​ ​Softmax​​. This activation function is often used together with categorical crossentropy. The softmax function highlights the largest values and suppresses low values. This in effect allows only 1 of the 10 nodes of the dense layer to put it's hand up. There are times when you don't want to squash all in favor of one (like saying this t-shirt is both red and has a logo) but in this experiment, we're trying to say "this is a t-shirt and not a coat or a bag or trousers or....”. Navigate to the Evaluation view and select your experiment in the left side Experiment section. Watch it train epoch by epoch. Select the Accuracy graph and you’ll notice that after epoch 5 the training and validation graphs diverge, the experiment starts to overfit. That means that the model is just memorizing the picture vs. understanding in more general terms what the shapes and shadows may depict. At the best epoch, number 5, we have accuracy 0.91. Does that beat your goal you set at the beginning of this tutorial? Yes, it does!! If you click Categorical crossentropy you’ll see the Loss graph. Loss indicates the magnitude of error your model made on its prediction. It’s a method of evaluating how well your algorithm models your dataset. If your predictions are totally off, your loss function will output a higher number. If they’re pretty good, it’ll output a lower one. The Confusion matrix is used to see how well a system does classification. In a perfect classification, you'll have 100% on the diagonal going from top left to bottom right. OK, let’s see if you can improve the model and get at higher accuracy. You see that after epoch 5 the training and validation graphs diverge, it starts to overfit quite a lot. The first thing to do would be to try some regularization, like increasing the drop-rate of the Dropout blocks. By default it’s set to 0.1, meaning 10 % of the input units are dropped, but you can try experimenting with higher values. If the training loss and validation loss becomes more similar the experiment is not so obviously over-fitting. Other ways to improve the model is to add blocks and change settings in the model. As long as you keep the same loss function, you can compare the results of the experiments and see which one is the best in the Evaluation view. This tutorial has shown you how fast and easy you can create and test experiments on the Peltarion Platform. You've built a basic CNN-model to solve a classification problem and acquired some basic deep learning knowledge. In this tutorial, only one label can be correct, but what if the object could have many labels, i.e., a shirt can be labeled both “red” and “short sleeve”. How do you solve such a problem? Check out our tutorial Predicting mood from raw audio data and learn how to solve a multi-label classification problem.